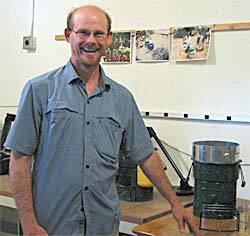 Mike Hatfield gave us an engaging education about rocket cook stoves at Aprovecho Research Center. 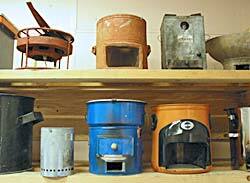 Tucked away in Cottage Grove Oregon, this is an offshoot of the Aprovecho center, which has been working on numerous appropriate technologies, including rocket stoves, since the 1970s.They’ve designed these low cost cook stoves to be so efficient that there’s essentially no smoke. Smokeless indoor cookstoves mean fewer respiratory ailments, especially for young children who are the most vulnerable.Mike’s associate Fred Colgan showed us the production facility where he fabricates the parts and assembly jigs for industrial-sized rocket cookstoves built from 55 gallon steel drums. They’re shipped and then assembled at their destination anywhere in the world. Aprovecho also tests the efficiency of rocket stoves from all over the world — I love the creative array of stoves — and produces an inexpensive kit which enables such stoves to be testing at centers elsewhere in the world.Why would Peak Moment TV tape a show about stoves used primarily in “developing” countries? I think we’ll find them used increasingly in “developed” countries, and not just as emergency preparedness gear.But more than that. Aprovecho’s work is a superb model of appropriate technology —where local people control the resources they need. And the designs are efficient, an increasingly central requirement as resource scarcity deepens. Watch Rocket Stoves – Hot, Healthy, Efficient (episode 214). I think Mr. Mike Hatfield had done a brilliant research on Wood burning cook stove. I can see in image there are many kind of wood cook stove’s and great informative post. Really very impressive.